Google Nexus 9 vs iPad Air 2: which tablet comes out on top? Google’s long-rumored Nexus 9 has finally broken cover - and it’s an important release, because it’s the reference device for Android L. It’s facing some stiff competition, though, and it's up against premium devices such as Apple's brand new iPad Air 2. Which flagship rocks the hardest? The Nexus 9 will have an 8.9-inch, 2,048 x 1,536 resolution display with a density of 287 ppi. The Air 2 has a bigger screen but lower pixel density: its IPS LCD is 9.7-inch and delivers 2,048 x 1,536 resolution at 264 ppi. HTC makes some nice hardware, but the Nexus 9 isn’t a patch on the iPad Air 2: Apple’s famous engineering prowess produces some genuinely beautiful designs, and to our eyes nobody has made a tablet that looks as good as the iPad Air. The Nexus 9 isn't a horse frightener, but it won't have the same premium feel as Apple's aluminum. While the iPad Air 2 doesn't look dramatically different from its predecessor, it's 18% thinner and a new way of making the display means it's more vivid. If you've seen the iPhone 6 screen up close, it's the same effect: the removal of air gaps between display components makes the pixels appear as if they're on the surface rather than behind glass. The processor inside the Nexus 9 is a dual-core Nvidia Tegra K1, a 64-bit processor with 2 GB of RAM. The iPad Air 2 has Apple's dual-core, 64-bit A8X processor with built-in motion co-processor and 1 GB of RAM. In its role as Android’s flagship device, the Nexus 9 will run Android L 5.0, aka Android Lollipop. Apple’s iPad Air 2 runs the latest version of iOS, iOS 8.1. The Nexus 9 has a 1.6 MP front-facing camera and an 8 MP rear-facing camera with optical image stabilization. Apple’s camera is also stabilized, albeit just for video recording, and it's been upgraded from 5MP to 8MP. It also gets the timelapse, burst and slo-mo features of the iPhone, and the 1.5 MP front-facing camera has a new sensor that promises to let in 81% more light. The Nexus 9 battery delivers 6,700 mAh, and the iPad Air has a whopping 8,827 mAh battery. Apple hasn't confirmed the size of the thinner Air 2's battery, but once again it promises 10 hours of real-world battery life. As is so often the case, Apple makes the more desirable product and the Android device is the more sensible buy. 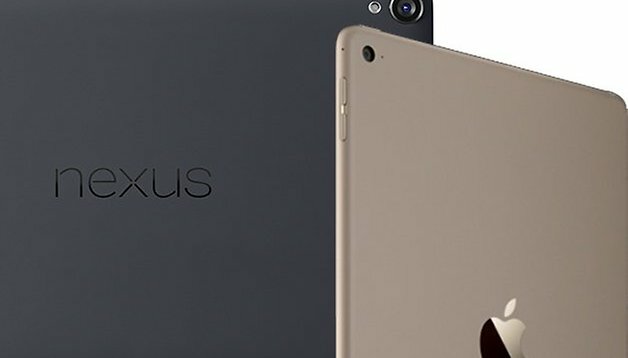 It might not have the brushed aluminum and chamfered edges of the iPad Air 2, but the Nexus is considerably more affordable. While the newest iPad benefits from a better camera, faster processor and improved battery life it's still going to cost more than the equivalent Nexus. What do you think? If someone made an Android tablet as pretty and as pricey as the iPad Air, would you buy it? Is style worth paying for? Google versus iPad, let's see: good performance, nice look, with subtle design notes, both are... , hmmm, I want them ! But if I were to choose one, the choice would be... Nexus 9. Because it has Android !! iPad Air 2 released on October 16. 2GB of RAM, A8 64 Bit (second generation) chip, dual screen for apps, & Touch ID.